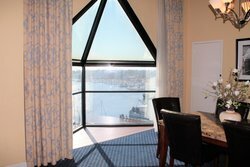 There is no better place to enjoy our hotel's waterfront views than in our Presidential Suite. 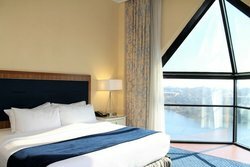 Steps from the king bedroom, your spacious living room is brightly lit, with panoramic windows that overlook spectacular views. 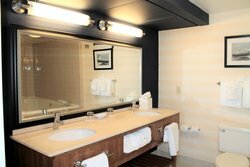 The suite includes a kitchenette and bar, complete with a coffee maker, a microwave, refrigerator, and high-top stools. 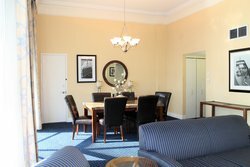 Order food and spend the night in, as the suite is equipped with a full-sized dining room table. 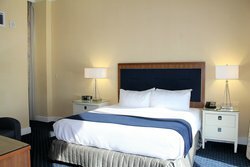 Work comfortably at the spacious work desk with complimentary high-speed Wi-Fi or lounge on the sleeper sofa with your favorite show on the 32” flat-screen TV with HBO. Sleep soundly in a plush king bed or indulge in a relaxing soak in the tub. 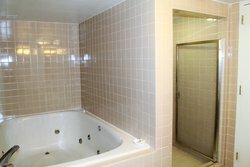 Featuring a soothing Jacuzzi tub, rinse the day away in the oversized spa bathroom, which also includes a walk-in shower. 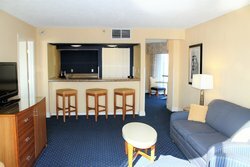 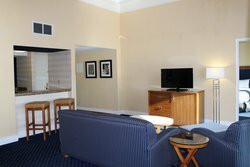 Enhance your next visit to Virginia with a stay in our Presidential Suite!